X-Mode Energy Shots on Tap, Jacked Apple has been on the market for about two months and the reviews are simply fantastic. This is our newest flavor and some people find it to be our best. Jacked Apple is maximum energy on demand. Try today and get jacked with X-Mode, the world’s best energy shot! You can buy X-Mode here on the official X-Mode website or on Amazon.com. Buy wherever you are most comfortable. To show you just how awesome is the X-Mode value, we have created the table below. If you want the best product at the best price, then X-Mode is the obvious choice. I just wanted to take a brief break from studying (procrastinating) to tell you guys how much I enjoy your product. First of all, I ordered it on Friday and I received it yesterday – that is some fast delivery AND with free shipping! It also came just in time; this week I had three presentations at my internship, a presentation for class, two tests, and a paper due. Xmode is a fast and effective product that works on a conceptual and realistic level, and it has kept my energy levels up during this insanely busy week. Being a college student in his last year as an undergrad, the extreme cost efficiency of this product was one of the major selling points that attracted me as a buyer. Finally, the thing I was most impressed with was the taste. I bought this product with the expectation that I was going to have to cringe while swallowing down the bitter ounce of liquid like literally EVERY other energy shot I have tried (Rip-it, 5-hour energy, etc.). What I found was that it was extremely palatable and I look forward to my daily shot. The only suggestion I have for improvement is a larger variety of flavors. I have and will sing your praises to other friends and consumers of energy drinks. I have already made a thread on [website name redacted by editor to preserve privacy] and the concept was well received. Keep up the great work, and I hope to see you around for a long time! In follow-up correspondence we found out what A.H. is planning to do with his life. A great message from a great man. X-Mode is honored to be the featured product for YouTube channel “The Report Of The Week’s” Fourth Anniversary video. For four years, The Report Of The Week has delivered entertaining, dead-pan reviews of energy drinks under their sub-channel name: Energy Crisis. Check their video report below. The YouTube channel, “The ExtraSpot” has reviewed X-Mode. The video provides more evidence that X-Mode is perhaps the best-ever reviewed energy shot. In the video, the reviewer “Spot” opens the 50-serving box and shows how X-Mode is dispensed. See how easy it is. * Reviewer likes the taste! The three fine gentlemen of the YouTube channel CultMoo have reviewed X-Mode Energy Shots on Tap. Their consensus is that X-Mode tastes great (way better than the market-leading shot) and is a strong and effective product compared to the multi-billion energy drinks that are so common. * X-Mode tastes great, way, way better than the market-leading shot. * X-Mode works well and is much stronger than other products like the major energy drinks. * Easy inference: if you are busy person, working a fast-paced job, then X-Mode is probably a great choice for you. Feel free to checkout their unbiased review below. Language is definitely not safe for work. Mr. Happy Reviews X-Mode with an A+ for Energy! YouTube channel MrHappy0121, a reviewer of energy drinks and popular food items, spent two weeks with our awesome 50-serving X-Mode Mini and the results are in. He loves it. Check his review below. * See the X-Mode Mini – it looks fantastic. Put one of those bad boys on your desk and be the cool kid at work. “Peep THIS Out” is a YouTube channel hosted by Ian Keiner. Ian K. creates awesome reviews for everything from beverages to fast foods to gadgets, producing a new review about twice per week. This makes Mr. K something of a reviewing expert. When we came across his channel, we reached out to see if he would review X-Mode. He agreed and off we shipped a Power Tower. Fortunately, he loved X-Mode and produced the awesome video below. Check it out. Derrick, the host of the YouTube channel Common Man Cocktails, graciously agreed to review X-Mode. As with any review, we are at the mercy of the reviewer. Fortunately, X-Mode is an epic great product and it appears that hosts Derrick and Ian agree. Check-out their high-energy YouTube review. 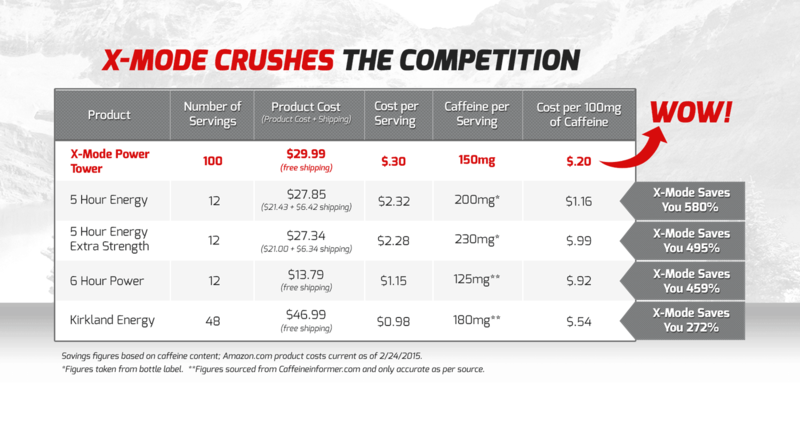 One of the biggest names in drinks and energy product reviews is PossessedbyCaffeine.com When this Dr. of Energy speaks, people listen. And the Dr. has spoken, rating X-Mode a perfect 10 for energy, a perfect 10 for packaging and a stupendously high 9 for flavor, an epic feat considering X-Mode has nearly 50% more caffeine per ounce than the leading brand. Our favorite part of the review: What more can I say – other than X Mode is a beast! Statements contained herein have not been evaluated by the Food and Drug Administration. This product is not intended to diagnose, treat, cure or prevent any disease. Copyright 2014-2018 © X-Life LLC All Rights Reserved.